I have been a lover of Asian food for most of my adult life. Among my favorites are Korean pickled vegetables, called Kimchi. Most people are only familiar with the one you’ll find in the supermarket, which is made of (generally) Napa cabbage and contains red chili pepper flakes. However, there are hundreds of varieties. There was until recently a pretty good Korean BBQ restaurant nearby that served a variety consisting of potatoes and sesame oil that I could make a meal out of. This, of course, is not a traditional variety of Kimchi but, being raised as a meat and potatoes kind of a guy, I found it immensely enjoyable. A good friend of ours has been making us one-gallon jars of Kimchi for many years. Usually it consists of quartered cabbage heads, vinegar, salt, dill, garlic, and yellow peppers, plus a few other spices. My wife, who is Sansei (3rd generation American-born Japanese), calls it Koko (similar to Tsukemono) and we enjoy it shredded with many a meal. Every once in a while our friend tries something else. For instance, just the other day she gave me a jar of pickled sweet onion. We have yet to taste them so the jury’s out on whether we’ll be happy with the result. A while ago – like maybe ten years (my, how time flies!) 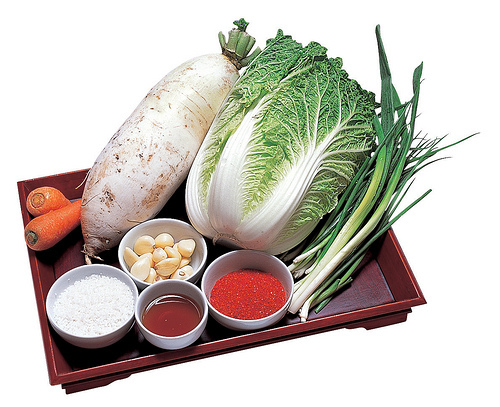 – she made a batch of Kimchi out of Daikon radish, dill, and garlic. Now another of the kinds of pickles I’m really fond of, and consider comfort food, is kosher pickles; the more garlic, the better. She had cut up the Daikon into spears about the size of a quarter of a pickling cucumber and they were magnificent. To my taste buds, these pieces of pickled radish tasted like the best kosher pickles I had ever had and I couldn’t get enough of them. At the time I took my lunch to work every day at ate at my desk. I brought some of these pickles with me one day and was sharing them with a colleague and friend who sat on the other side of our 1/2 height cubicle wall. We were marveling at the fullness of the flavor when I noticed people standing up at their desks and looking around. The term used back then for what I witnessed was “prairie dogging” and I soon heard someone say “what’s that smell?” I looked at my friend and, frankly, we didn’t smell anything. We were too busy enjoying the incredible, garlicky flavor of this wonderful condiment. In retrospect, I think we were insulated from the truth because we were so enamored of the flavor, and we chose to ignore what others were agitated about lest we had to stop eating. I later discovered someone had actually called Environmental to suggest something had died in the ducting and request an inspection. I know I ultimately explained what the cause of the stink was, but I don’t think it was until much later. Chea Yon has never again made that particular kind of Kimchi for us, but I would kill to relive the experience. This entry was posted on Monday, December 19th, 2011 at 9:39 am	and tagged with cucumber, Daikon, garlic, Kimchi, Korean food, kosher, pickles, spicy and posted in Business, Food-Cooking-and Eating. You can follow any responses to this entry through the RSS 2.0 feed.